04 Nov 2016 --- Olam Cocoa is marking 70 years of Joanes with the launch of a sodium dark cocoa powder with no added sodium, opening a new product development & innovation center and inaugurating a sustainability program to improve yields and good labor practises amongst growing communities. Olam Cocoa opened the Cocoa Product Development & Innovation Centre at its llhéus processing facility yesterday (Nov 3) - and to coincide, launched the AJ11PK cocoa powder which it says meets the growing market demand for lower sodium products. AJ11PK cocoa powder has been developed for the Brazil and South American markets and especially launched to celebrate leading Brazilian cocoa brand, Joanes. It can be used across multiple applications, including chocolate, confectionery, compounds, dairy, bakery goods, ice cream and fillings. Olam says its new innovation aligns with Pan-American Health Organisation (PAHO) policy to reduce dietary salt intake amongst South American consumers by giving them a high quality alternative. PAHO is advocating a salt reduction target of consuming less than five grams per day by 2020. 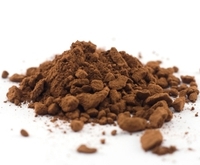 Olam Cocoa has developed a unique technology to bypass the need for added sodium which is traditionally added as an alkalizing agent during processing to give dark cocoa powders the desired color, and therefore increases the overall sodium content of the end-product. Using its method the cocoa powder does not need sodium processing and is less bitter than other classically produced dark cocoa powders. “Our investment at Ilhéus is the latest in our efforts to support customers in their own region with both new concepts and existing product refinement, thus significantly reducing their time to market. The development of the AJ11PK cocoa powder was directly inspired by our Latin American customers’ needs for an alternative. The result – a fantastic tasting black cocoa powder with no sodium,” says global head of cocoa product development and innovation, Rinus Heemskerk. Dedicated Product Development and Innovation (PDI) team members now join Olam Cocoa’s expanding, global team of technical experts based in its other five Cocoa Innovation Centres located in the Netherlands, Singapore, Spain, USA and the UK. Olam sources from a network of around 1,000 Brazilian farmers and is to expand its Olam Livelihood Charter (OLC) program to help improve yields, quality and incomes. Brazil accounts for approximately 10 percent of Olam Cocoa’s global processing with products like natural and alkalized cocoa powder, cocoa butter and cocoa liquor. Brazil represents a crucial segment for Olam Cocoa, not only as a foothold in the critical Latin American market, but as Kidambi Srinivasan, cocoa business head for Brazil, explains, the country is important within the company’s global portfolio. “Utilising our origination experience to establish strong relationships with Brazilian cocoa farmers and co-operatives is key to building world class traceability and sustainability partnerships with our suppliers and customers. This, coupled with Olam Cocoa’s continued investment in Joanes’ first - class products, services and innovation, is helping to strengthen customer relationships across the continent and beyond,” he says. Desserts & Ice Cream Olam Cocoa Dark Black Cocoa Powder Sodium Sustainable Cocoa Farming Brazil Joanes AJ11PK Cocoa Powder Llhéus Pan-American Health Organisation (PAHO).